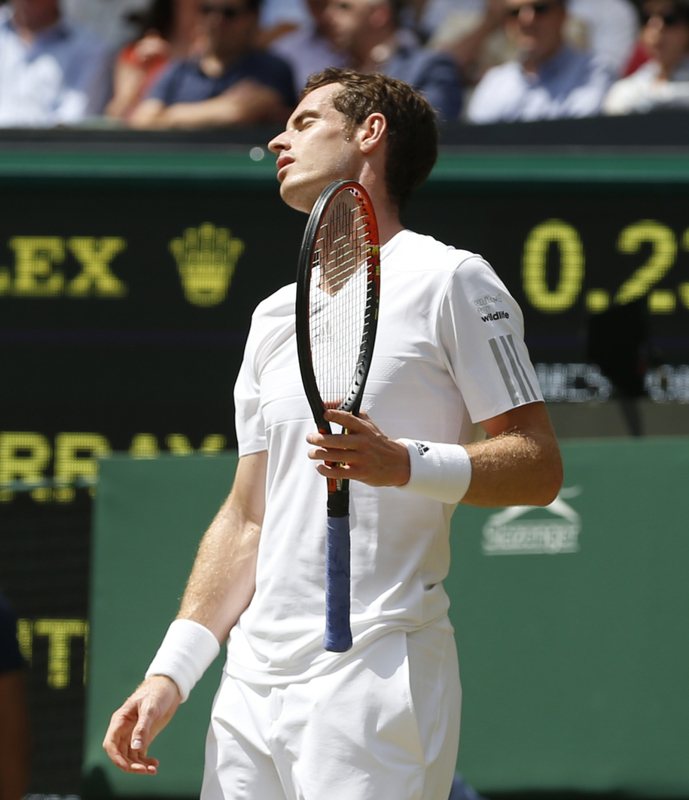 The crowd of nearly 15,000, usually so vociferous in support of Murray, were left silent. Meanwhile, Roger Federer advances to the semifinals. LONDON – The silence at Centre Court made abundantly clear that Andy Murray’s time as Wimbledon champion was coming to a close. 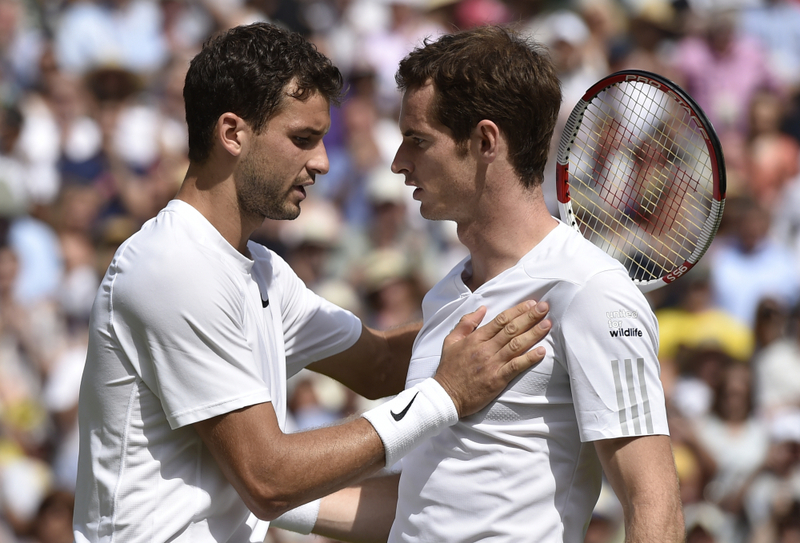 Out of sorts from the start of his quarterfinal against up-and-coming Grigor Dimitrov on Wednesday, Murray – who in 2013 ended Britain’s 77-year wait for one of its own to win the men’s title at the All England Club – sailed an awkward backhand slice long to fall behind by a set and a break. The crowd of nearly 15,000, usually so vociferous in support of Murray, sat quietly, perhaps not prepared to believe what was happening. All along, Murray’s body language was as negative as his play: He gnawed on his knuckle after seeing an ace zip past; slapped his forehead with his palm after one forehand found the net; bowed his head and slumped his shoulders after another did the same. When one last forehand fell short, the magical ride ended for Murray and his fans with a 6-1, 7-6 (4), 6-2 loss to the 11th-seeded Dimitrov, who became the first man from Bulgaria to reach a Grand Slam semifinal. He hadn’t lost a set in his first four matches, but made 37 unforced errors Wednesday, more than twice as many as Dimitrov. 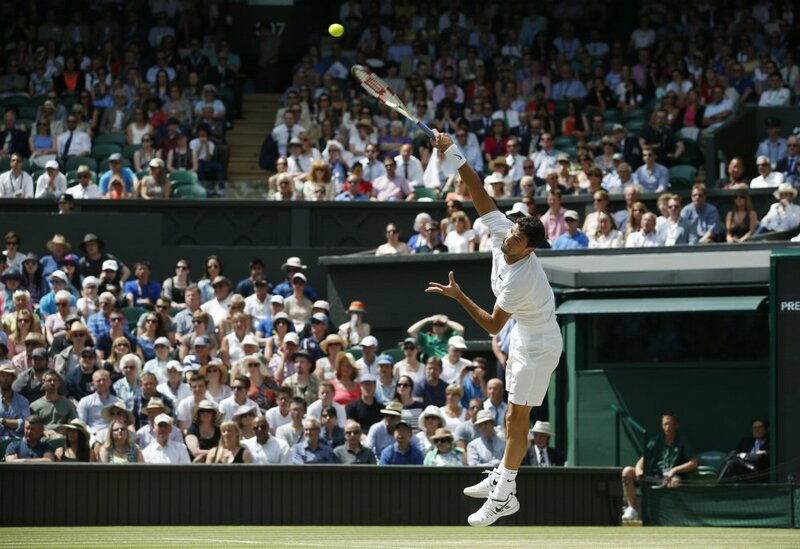 Dimitrov was composed throughout, getting broken only once and showing off the all-court game and smooth, one-handed backhand that long ago earned him the nickname “Baby Fed” – as in seven-time Wimbledon champion Roger Federer. On Friday, Dimitrov takes on another past champ, top-seeded Novak Djokovic, who returned to the semifinals for the fifth consecutive year by coming back to beat No. 26 Marin Cilic of Croatia 6-1, 3-6, 6-7 (4), 6-2, 6-2. Djokovic was troubled by Cilic, to be sure, but also by repeated slips that prompted the Serb to change his shoes midway through the match. Playing on No. 1 Court, Djokovic also was rattled by intermittent cheering from outside the arena for Murray, whose match was played simultaneously across the way. “I said to the chair umpire: ‘Let’s just stop (our) match, put (theirs) live on the big screen, and let’s watch it ’til they’re done,”‘ recounted Djokovic, last year’s runner-up to Murray. On the other half of the draw, Federer will face No. 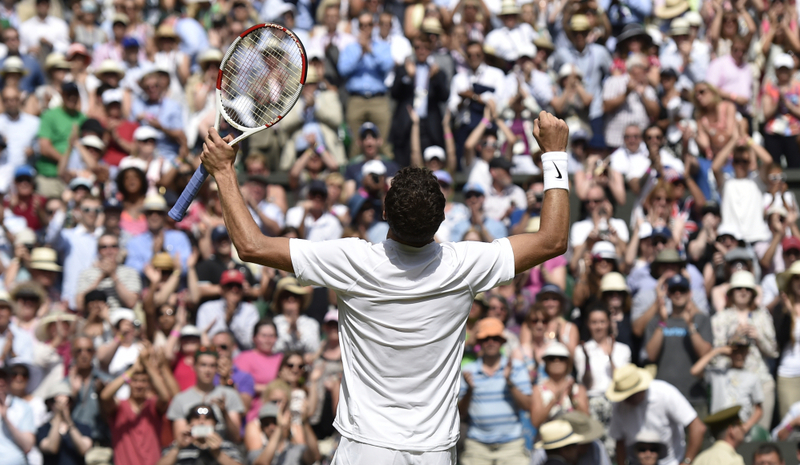 8 Milos Raonic, the first Canadian man in a Grand Slam semifinal since 1923. Federer was broken for the first time in the tournament, and dropped a set for the first time, too, but defeated Australian Open champion Stan Wawrinka 3-6, 7-6 (5), 6-4, 6-4 in a matchup between a pair of pals from Switzerland. In 2013, Federer lost in the second round at the All England Club. Raonic outserved Nick Kyrgios – the 19-year-old Australian who eliminated Rafael Nadal in the fourth round – in a 6-7 (4), 6-2, 6-4, 7-6 (4) win with the help of 39 aces. In the women’s quarterfinals, No. 3 Simona Halep beat 2013 runner-up Sabine Lisicki 6-4, 6-0, and now faces No. 13 Eugenie Bouchard, who got past No. 9 Angelique Kerber 6-3, 6-4. Thursday’s other semifinal is 2011 champion Petra Kvitova against No. 23 Lucie Safarova. Kvitova is the only woman left who has won a major title. Dimitrov and Raonic, both 23, would like to see that among the men. It’s the ninth year in a row that at least two members of tennis’ so-called “Big 4” – Federer, Djokovic, Nadal, Murray – made the semifinals at Wimbledon. That quartet has earned the last 11 trophies.